If you are 70 and looking for reliable income and high yields, these two iconic stocks should be on your buy list today. Investing is vastly different when you get into your 70s and 80s than it was when you were in your 30s and 40s. The desire for growth stocks shifts to a need for reliability and income. That's exactly what you'll find with international energy goliath ExxonMobil Corporation (NYSE:XOM) and food giant General Mills, Inc. (NYSE:GIS). Here's why you should consider buying these two high-yield stocks today if you're 70 or older. Exxon stock is down around 4% so far this year, while most of its major integrated energy peers are in positive territory. That decline means Exxon's stock currently yields around 4%, roughly twice what you would get from an S&P 500 Index fund. That yield is toward the high end of the company's historical range, too, suggesting the stock is attractively valued today for income-focused investors. And, unlike most of its peers, Exxon increased its dividend each year through the deep oil downturn that started in mid-2014. Its annual streak of dividend increases is up to 36 and counting at this point, showing just how reliable the energy giant is even in the face of adversity. But why is Exxon struggling relative to peers right now? The answer is that its production is falling and its return on capital employed figures have weakened relative to competitors. That's not great news, but you have to consider these issues in context. Exxon is a conservatively run company that makes slow and deliberate changes. It isn't surprising that it's a little out of step as the oil market has started to turn higher. Nor should it be surprising that it is working to fix these problems. For example, it has large projects on tap in the offshore oil space, in natural gas, and is investing heavily in U.S. onshore drilling. These projects are expected to represent roughly half of the company's energy production by 2025. That's a long way off, but with debt at just about 11% of its capital structure today, there's not much worry about Exxon being able to support these commitments. Yes, Exxon's production is weak today, testing investors' resolve, but the future looks much brighter. 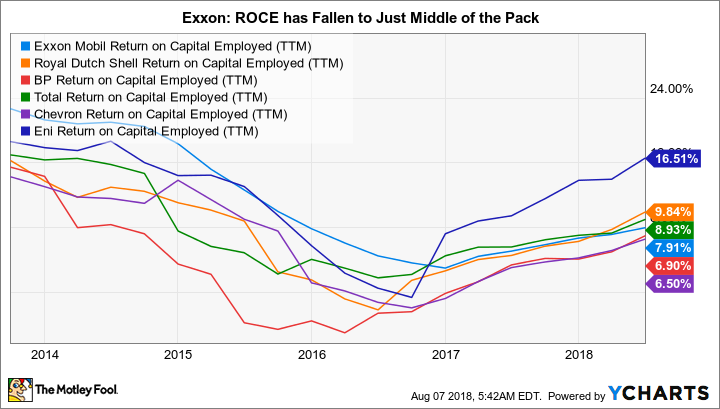 As for return on capital employed, a metric that tracks how well a company is investing its shareholders' money, Exxon is working to up its game. The goal is to get from the 7% range into the mid- to high teens. The plan to get there includes taking control of more of its investments, allowing Exxon to put its expertise with complex energy projects to better use. It also involves focusing on high-margin oil projects over low-margin ones that boost production quickly at the expense of profitability. Exxon is taking the long view, just like it always has. The problem is that it's going to take some time for Exxon to turn the ship. Near-term results are likely to be out of step with peers for at least a year or so. But I see that as creating an opportunity for investors seeking a high yield from a reliable dividend payer. Next up is packaged food giant General Mills, whose stock has fallen 35% from its mid-2016 highs. Although the broader market may still be in a bull market, General Mills' stock sure looks like it's being mauled by a bear. 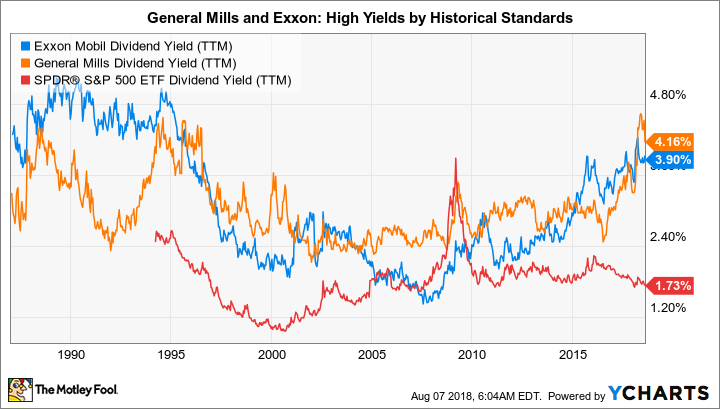 That, however, has pushed the yield up to 4.2%, the high end of the company's historical range, suggesting now is a good time for income investors to take a close look at the stock. Note that the company has increased its dividend annually for 14 consecutive years and paid an uninterrupted dividend for 119 years. That's pretty reliable. Why the deep price decline? For starters, customer buying habits have been shifting away from the packaged products that General Mills sells. The company is not sitting still. It is shifting toward the healthier fare that consumers are in search of today with acquisitions like Annie's, Lara Bar, and Epic. It is also pushing innovation in existing brands like Yoplait (which pretty much missed the Greek yogurt craze), Nature Valley, and its various cereal brands. More recently it purchased Blue Buffalo, expanding its portfolio to include healthy pet food. This over 100-year-old company has adjusted to shifting tastes before and is working to do so again. That said, there are two other issues to track here. First, input cost inflation has investors worried that General Mills, and its peers, won't be able to pass rising costs on to customers. Inflation ebbs and flows over time and, eventually, the food giant will adjust to higher costs just like it has before. The issue is likely overblown, but will indeed hamper near-term earnings. Second, and more concerning, buying Blue Buffalo was an expensive affair, leaving General Mills with a heavier debt load than it has historically carried. Management plans to focus on debt reduction for the next couple of years to resolve this issue. That may mean no dividend increases for a little while, but with an over 4% yield, that shouldn't be too much of an issue for conservative investors. Confronting three notable issues, I can see why short-term investors are worried here. But General Mills has proven itself over time, so income investors looking for a reliable company with a fat yield should look past the current round of problems and take advantage of the deep price decline. Exxon and General Mills aren't shiny new pennies; they are a little scuffed-up and worn with age. But they have proven, time and again, that they can keep rewarding investors -- notably via dividends. With these reliable dividend payers offering high yields today, investors of all ages should be considering them for their portfolios. However, those in their 70s and beyond, looking for income and reliability, should take a particular liking to these two giants.